Betty Williams (born 22 May 1943, Belfast, Northern Ireland) is a co-recipient with Mairead Corrigan of the Nobel Peace Prize in 1976 for her work as a cofounder of Community of Peace People, an organization dedicated to promoting a peaceful resolution to the Troubles in Northern Ireland. Williams heads the Global Children's Foundation and is the President of the World Centre of Compassion for Children International. She is also the Chair of Institute for Asian Democracy in Washington D.C. and a Distinguished Visiting Professor at Nova Southeastern University. She lectures widely on topics of peace, education, inter-cultural and inter-faith understanding, anti-extremism, and children's rights. Williams is a founding member of the Nobel Laureate Summit, which has taken place annually since 2000. In 2006, Williams became a founder of the Nobel Women's Initiative along with Nobel Peace Laureates Mairead Corrigan Maguire, Shirin Ebadi, Wangari Maathai, Jody Williams and Rigoberta Menchú Tum. These six women representing North and South America, the Middle East, Europe and Africa, bring together their experiences in a united effort for peace with justice and equality. It is the goal of the Nobel Women's Initiative to help strengthen work being done in support of women's rights around the world. Williams also is a member of PeaceJam. Williams was born on 22 May 1943 in Belfast, Northern Ireland. Her father worked as a butcher and her mother was a house wife. Betty received her primary education from St. Teresa Primary School in Belfast and attended St. Dominic's School for her high school studies. Upon completing her formal education, she took up a job of office receptionist. Rare for the time in Northern Ireland, her father was Protestant and her mother was Catholic; a family background from which Williams later said she derived religious tolerance and a breadth of vision that motivated her to work for peace. Early in the 1970s she joined an anti-violence campaign headed by a Protestant priest. Williams credits this experience for preparing her to eventually found her own peace movement, which focused on creating peace groups composed of former opponents, practicing confidence-building measures, and the development of a grassroots peace process. Betty Williams was drawn into the public arena after witnessing the death of three children on 10 August 1976, when they were hit by a car whose driver, an IRA guerrilla named Danny Lennon, had been fatally shot in return fire by a soldier of the Kings Own Border regiment As she turned the corner to her home, she saw the three Maguire children crushed by the swerving car and rushed to help. Their mother, Anne Maguire, who was with the children, eventually committed suicide in 1980 after a failed attempt to start a new life in New Zealand. Williams was so moved by the incident that within two days of the tragic event, she had obtained 6,000 signatures on a petition for peace and gained wide media attention. She co-founded the Women for Peace which later, with co-founder Ciaran McKeown, became The Community for Peace People. Williams soon organised a peace march to the graves of the slain children, which was attended by 10,000 Protestant and Catholic women. However, the peaceful march was violently disrupted by members of the Irish Republican Army, who accused them of being "dupes of the British". The following week, Williams led another march that concluded successfully without incident – this time with 35,000 participants. We have a simple message to the world from this movement for Peace. We want for our children, as we want for ourselves, our lives at home, at work, and at play to be lives of joy and Peace. We recognise that to build such a society demands dedication, hard work, and courage. We recognise that there are many problems in our society which are a source of conflict and violence. We recognise that every bullet fired and every exploding bomb make that work more difficult. We dedicate ourselves to working with our neighbours, near and far, day in and day out, to build that peaceful society in which the tragedies we have known are a bad memory and a continuing warning. In recognition of her efforts for peace, Williams, together with her friend Mairead Corrigan, became joint recipients of the Nobel Peace Prize in 1977 (the prize for 1976). "That first week will always be remembered of course for something else besides the birth of the Peace People. For those most closely involved, the most powerful memory of that week was the death of a young republican and the deaths of three children struck by the dead man's car. A deep sense of frustration at the mindless stupidity of the continuing violence was already evident before the tragic events of that sunny afternoon of August 10, 1976. But the deaths of those four young people in one terrible moment of violence caused that frustration to explode, and create the possibility of a real peace movement...As far as we are concerned, every single death in the last eight years, and every death in every war that was ever fought represents life needlessly wasted, a mother's labour spurned". Since winning the Nobel Peace Prize, Williams has received the People's Peace Prize of Norway in 1976, the Schweitzer Medallion for Courage, the Martin Luther King, Jr. Award, the Eleanor Roosevelt Award in 1984, and the Frank Foundation Child Care International Oliver Award. In 1995 she was awarded the Rotary Club International "Paul Harris Fellowship: and the Together for Peace Building Award. At the 2006 Earth Dialogues forum in Brisbane, Williams told an audience of schoolchildren during a speech on Iraq War casualties that "Right now, I would like to kill George W. Bush." From 17 to 20 September 2007, Williams gave a series of lectures in Southern California with the theme "Peace Is Action, Not Words." On 18 September, Mrs. Williams presented a lecture to the academic community of Orange County entitled "Peace in the World Is Everybody's Business." On 20 September, she gave a lecture to 2,232 members of the general public, including 1,100 high school sophomores. Speaking at the University of Bradford before an audience of 200 in March 2011, Williams warned that young Muslim women on campus were vulnerable to attacks from angry family members, while the university does little to help protect them. "If you had someone on this campus these young women could go to say, 'I am frightened' – if you are not doing that here, you are dehumanising them by not helping these young women, don't you think?" At the time she received the Nobel Prize, Williams worked as a receptionist and was raising her two children with her first husband Ralph Williams. 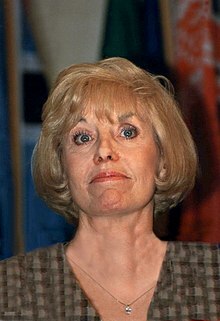 After they divorced, she married James Perkins in 1982, and resided in Ponte Vedra Beach, Florida in the United States. She toured and lectured extensively, taking the Nobel Peace Prize with her, so others could see and be inspired by it. Her son Paul became a professional footballer playing for Newport County, Sheffield United, Hartlepool United, Stockport County, West Bromwich Albion and Rochdale. He made one appearance for Northern Ireland. In 1992, she was appointed to the Texas Commission for Children and Youth by then Texas Governor, Ann Richards. She spent time as a visiting professor at Sam Houston State University, in Huntsville, Texas. In 2004, she returned to live in Ireland where she currently resides. Betty Williams was honoured/featured in the music video of Nickelback's hit song If Everyone Cared. Betty Williams and Mairead Corrigan were also the subject of a French song, "Deux Femmes à Dublin", sung by French Pied-Noir singer Enrico Macias. ^ "14th Nobel Peace Laureate Summit takes place in Rome". Anadolu. AA. 12 December 2014. Retrieved 1 January 2015. ^ Williams, Betty (10 December 1976). "Peace must be built from below". Anadolu. AA. Retrieved 1 January 2015. ^ "Troubles became rallying cry". 11 March 2009 – via news.bbc.co.uk. Williams, Betty. "'Each Child Belongs to Us': A New way forward for children of the world". Peace Proposal. Archived from the original on 15 July 2011. Retrieved 23 February 2011. Provisional I.R.A., on a mission to kill British soldiers, opened fire from the back of a speeding car on an Army foot patrol. They missed. The foot patrol returned fire killing the driver of the car, a young man named Danny Lennon. ^ "The Peace People Declaration". ^ "Gifts of Speech - Betty Williams". gos.sbc.edu. ^ "The Nobel Peace Prize 1976". NobelPrize.org. ^ "Nobel Peace Laureate: "I Would Love To Kill George Bush"..." Huffington Post. 2008-03-28. Retrieved 2017-10-03. ^ Greenhalf, Jim (4 March 2011). "Bradford University is told it must do more to stop attacks on the vulnerable Muslim women". Telegraph & Argus. Newsquest. Retrieved 10 March 2011. This page was last edited on 18 April 2019, at 06:15 (UTC).